Liu, X., Smith, G. D., Jiang, Z., Bock, M. C. D., Boeck, F., Frith, O., Gatóo, A., Liu, K., Mulligan, H., Semple, K. E., Sharma, B., and Ramage, M. (2016). "Nomenclature for engineered bamboo," BioRes. 11(1), 1141-1161. In recent years, there has been a rapid rise in the development of engineered bamboo materials, which have the potential to play an important role as alternatives to conventional building materials. Despite the growing diversity of bamboo products available on the market, the international standardization of both bamboo products and their constituent elements is limited, and a lack of universal nomenclature is recognized as one of the main constraints on developing standards. Similar or identical terminology is used interchangeably to describe different bamboo elements, processes, or products across sectors and continents. In some cases, translated colloquial names are misleading and scientifically inaccurate, which forms a barrier to global collaboration and research, creates ambiguity, and potentially limits trade. The present work aims to address this gap by proposing a set of appropriate terms in English that accurately describe and differentiate between currently produced engineered bamboo products and their constituent elements, accompanied by parallel terms in Chinese and Spanish. From these, new categories of engineered bamboo building materials are proposed for the Harmonized System of product codes. This paper highlights current ambiguities and provides terminology together with clear definitions of the main primary elements, processing steps, and products. Bamboo is a rapidly renewable material that is globally available. Across Asia, Africa, and Latin America, there are more than 70 genera of bamboo and approximately 1,200 recognized species in the world, with an estimated growing area of about 36 million hectares (Jiang 2007; Lobovikov et al. 2007). Bamboo mostly grows in tropical, subtropical, and warm temperate zones of Asia-Pacific, the Americas, and Africa from 46°N latitude to 47°S latitude (Jiang 2002). Because of its short growth cycle, desirable material and mechanical properties, bamboo has the potential to serve as a contemporary environmentally friendly construction material. There is enormous variety in products made from bamboo in different countries; China alone registers nearly 10,000 distinct bamboo products in over 100 categories for uses as diverse as construction, furniture, decoration, handicrafts, paper, packaging, transportation, medicine, food, textiles, and chemical extracts (Hou et al. 2009). China is currently the world’s largest exporter of bamboo products, accounting for over half of the global trade (Hunter 2003). Manufacturing of bamboo building materials is emerging in other regions where bamboo is a locally available material, including South America, Africa, and Southeast Asia. With the rapid growth in bamboo processing industries and the associated development of national, industry, and local standards, a range of ambiguous and conflicting terms has appeared. Particularly in China, the problem has become so acute that the government is in the process of drafting a dedicated national standard (ICS/GB 2009). As in China, international research and product development for bamboo-based materials is hampered by the lack of a commonly accepted nomenclature for the bamboo sector. Obscure, inaccurate terminology for bamboo elements (collectively termed ‘furnish’), processes, and products leads to confusion among a variety of stakeholders, including suppliers, primary and secondary processing industries, scientists and researchers, trade bodies, and consumers. In this paper, we focus only on bamboo building materials, highlighting the common types of engineered bamboo building materials produced in bamboo-processing countries, including China, Colombia, and India. We review the nomenclature currently used for engineered bamboo products and their constituent elements and discuss some of the key problems in terminology. Our objective is to propose a standardized nomenclature system for constituent elements, intermediate and final products, and production processes to promote understanding, collaboration, and further development within the engineered bamboo products industry. Conversely, ‘scrimber,’ a term for a reconstituted wood product (Hutchings and Leicester 1988; Bowden 2007), has been adopted in both process and final product form for a bamboo product that is referred to commercially and in research by multiple names. Reconstituted bamboo ‘scrimber’ is known under a variety of terms, including ‘strandwoven bamboo,’ ‘bamboo restructured lumber,’ ‘restructured bamboo,’ ‘laminated bamboo bundle lumber,’ and ‘bamboo steel’ (Song et al. 2010; Hu et al. 2011; Anonymous 2013; Haihui et al. 2013; Zhang et al. 2013). ‘Restructured bamboo’ is more popular in business and marketing sectors, while ‘bamboo restructured lumber’ is a more scientific term. Strandwoven bamboo is an example of an identifier that is misleading and inaccurate; the product is neither made from strands (as they are known in wood processing) nor woven in any way. Standardized names and definitions of distinct types of bamboo products should be based on furnishing and processing techniques. The use of terminology from the synonymous wood-based product makes for an easy comparison if the bamboo-based product is similar and based on the same processing technology, e.g., oriented strand board or fiberboard. Other terms, such as ‘plywood’ when referring to bamboo sheets, need to be reconsidered. Table 1. List of Existing Bamboo Standards by Country of Origin (reproduced with permission, Gatóo et al. 2014). There are three published international standards for bamboo issued by the International Organization for Standardization (ISO) (Table 1); however, there are no existing standards that comprehensively address engineered bamboo elements, processes, or products. While standards development has lagged at the international level, a number of countries are developing their own standards to keep pace with a growing bamboo-processing industry. For example, China has produced 11 national standards, 26 industrial standards, and three local standards for engineered bamboo. Other countries, such as India, Colombia, and the United States, now have bamboo industries and are also developing country-specific fabrication and quality standards (Gatóo et al. 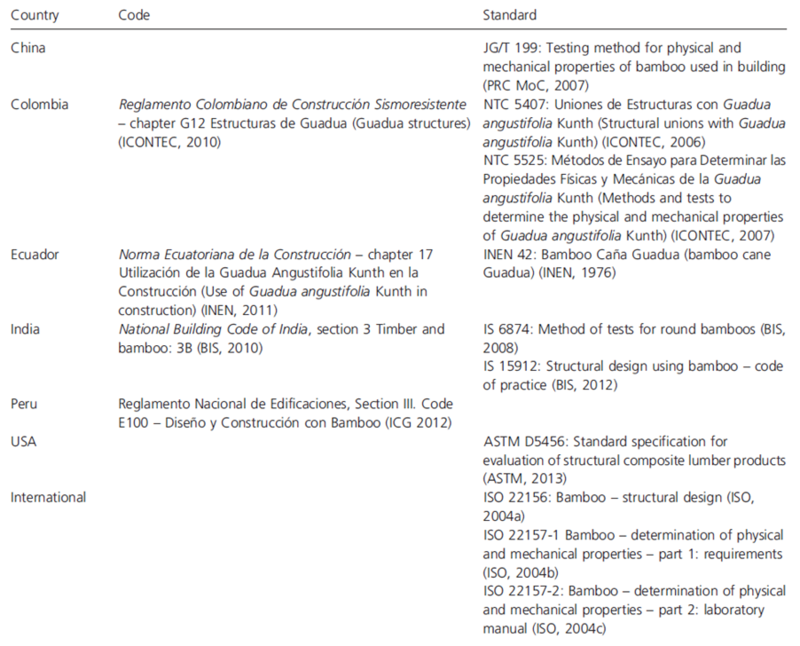 2014), from which a summary of existing standards pertaining to bamboo is presented in Table 1. This paper lists the proposed terminology for describing the elements, manufacturing, and final products of engineered bamboo. We briefly cover the ’round’ and ‘split’ bamboo categories and focus more extensively on the emerging engineered bamboo products that are increasingly used in the construction industry. Descriptions of manufacturing processes and bamboo terminology not directly related to engineered bamboo exceed the scope of this paper. Each term is presented with a short discussion covering the definition, as well as listing other terms that have been used in its place. 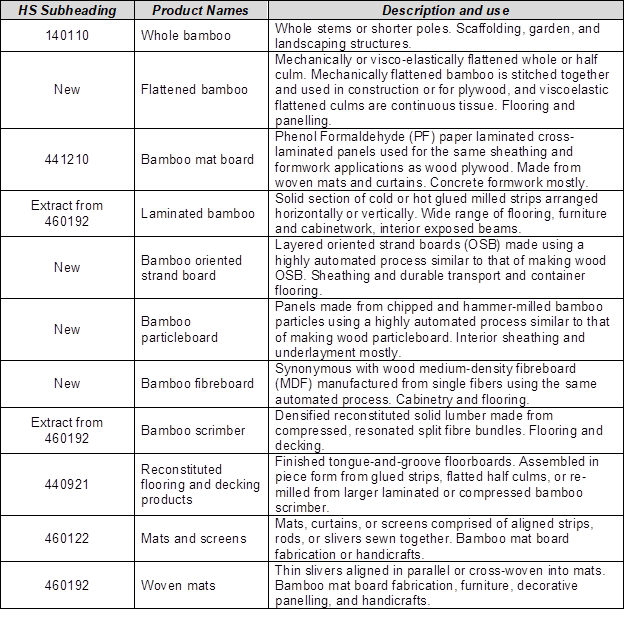 Terms are grouped into three main categories: furnish (Table 2); processing (Table 3); and products (Table 4). At the end of each category section, the terms are summarized with their equivalents in Spanish and Chinese, technical specifications such as element size, and representative images for clarity. The nomenclature and definitions presented are also used to propose a revision to the Harmonized System of nomenclature and product classification, which is an internationally recognized system (through the World Customs Organization, WCO) of names and numeric codes to classify internationally traded bamboo products. Further details on the HS and its proposed amendments are covered in the Harmonized System section. Full Culm Bamboo refers to seasoned (treated or untreated) culms used for vernacular construction, scaffolding, and increasingly in Latin America, for innovative structures including foot bridges, pavilions, and resort buildings. Engineered Bamboo represents bamboo products that have undergone processing primarily to produce consistent, straight-edged building materials from round, irregular culms. It is used to refer to a wide variety of reconstituted composite materials produced by first breaking down the whole culm into smaller pieces, termed furnish, and then gluing them together into a composite panel or dimensioned lumber stock using modern adhesives common to the wood industry. The composite may be finished and sold in final form, such as a board, or undergo secondary processing into a different finished form, for example milled dimensioned lumber and floorboards from larger scrimber billets. Collectively, these are termed ‘engineered bamboo;’ common examples include architectural surfaces, flooring, concrete formwork panels, and exterior decking. Engineered bamboo includes building materials that are used in both primary (e.g., framing and sheathing) and secondary (e.g., paneling, floorboards, skirting, and trim) applications. Full-culm preservation or coating is not considered to be engineered bamboo. Furnish is defined as ‘furnishing or providing something to a house or person’ (OED 2001); it is also a collective, although unscientific, term borrowed from the wood industry and is used to describe the smallest components or elements from which an engineered composite is made. Examples from the wood-based composite industries include ‘veneers’ for plywood, hammer-milled ‘particles’ for particleboard, ‘flakes’ or ‘strands’ for wafer and strand boards, and ‘fibers’ for medium-density fiberboard. For example, applying this concept to engineered bamboo, engineered flooring products are composed of many small, rectangular milled strips glued together to form a plank or ‘floor board.’ In this case, furnish is the collection of individual bamboo strips. If the product were particleboard made from small particles of bamboo, furnish would refer to the collection of individual particles. The synonymous term ‘element’ is used as a more descriptive collective noun for the individual components of bamboo composites. Culm is the stem of the bamboo plant made up of a series of segments (internodes) separated by diaphragms (nodes). ‘Culm’ is sometimes also used interchangeably with ‘pole’. The Chinese language makes a distinction between the uses of these words, but English does not. Bamboo culm is commonly processed into a series of shorter lengths that are used in scaffolding or full culm bamboo construction, or further broken down into smaller elements for engineered bamboo. Split refers to larger segments, thick sections, or thin strips of culm that are used in a range of more traditional building applications, such as woven matting for wall and floor applications or a loose woven or nailed lattice structure that acts as a reinforcement for mud, mortar, or concrete in wall structures. The technique of weaving bamboo strips through wooden or larger split bamboo bars of a wall trellis appears in traditional bamboo house construction in Africa (especially Ethiopia) and Southeast Asia. Also known as: Splint, Lath Section, Slat, and Round Strip. Half-split Culm is the largest form of a split. Nodes can be removed from these units using hand tools. Half-split culm has a variety of traditional uses in bamboo structures, including roof tiles and drainage ducts. Also known as: Half-Round Bamboo. Strip is a split that has been dried and milled into a fixed rectangular cross-section (CAF 2011). It has had the inner and outer culm wall layers removed, leaving anywhere from approximately 3 to 10 mm of thickness in the radial direction, and may be up to 25 mm wide in the tangential direction. By definition, strips are wider in the tangential direction than the radial direction and are commonly used for laminated planks, sheets, or larger cross-sections. Sliver is a strip that has been further reduced to thinner elements either by hand or by passing it through a slivering machine to produce sections that can be wider in the radial direction than they are in the tangential direction, or vice-versa. These usually range from 0.5 to 3.5 mm in thickness (Lin et al. 2012). Slivers are easily deformed, have good tensile strength, and are mostly used for woven mats. Strand is a short sliver of wood or bamboo whose thickness ranges from approximately 0.5 to 0.8 mm and by definition is longer than it is wide. Strands are the elements used to make oriented strand board (OSB), in which case they normally range from about 10 to 50 mm in width and 100 to 120 mm in length. For thicker panels based on longer strands for container flooring, the strand length is 150 to 180 mm. They are produced using the same stranding machinery used to produce wood strands for the OSB industry. Chip in the context of the starter element for wood pulp production is a short piece of wood whose ends are sliced at an acute angle to expose as large an area as possible of transverse (across the grain) and more permeable surface to pulp-digesting chemicals. They are chopped by rotating blades from the ends of logs fed at an angle against a large knife-mounted disk. Chips of bamboo (Yamashita and Machida 2011; Xu et al. 2012) can be produced using wood chipping machinery and like wood chips, form the base elements for pulp and paper manufacture. While the concept and geometry of bamboo chips is synonymous with wood chips, the final size and appearance of bamboo chips may differ from wood chips because of limited wall thickness, and bamboo tissue exhibits different chipping and splitting behavior compared with solid wood. Bamboo chips generally have a thickness of less than 3 mm and a length of between 30 and 50 mm, and are not known at the time of writing to be used to make structural composite materials. Particles are further processed 1 to 5 mm wide and thick, 1 to 20 mm long bamboo chips. Like the wood version, bamboo chips are an important intermediate processing step that allows the tissue to be further processed into ‘particles’ using the same hammer milling equipment used to produce wood particles for particleboard or fibers for fiberboards. Fiber represents a distinct family of primary processed bamboo elements. Bamboo fiber refers to single bamboo fiber cells and not an aggregation of multiple fiber cells as is commonly used. A bamboo fiber is obtained from the chemical or mechanical processing of bamboo (NFU 2006). A fiber is anatomically defined as single cell, and many species of bamboo produce fibers that are similar in size to wood fibers and tracheids (vascular wood-cells). An individual bamboo fiber from Moso bamboo (Phyllostachys pubescens Mazel) has a diameter of approximately 17 µm and a length of approximately 1.5 mm (Liese and Grosser 1972; Andtbacka and Imai 2000). Fibers account for 40 to 50% by content of the whole plant tissue or 60 to 70% by weight of the culm tissue (Liese 1998). As with wood fibers and tracheids, these are primarily used in papermaking and fiberboard composites. Fiber Bundles refers to the crushed culm wall segments that may be separated and used to manufacture reconstituted lumber. These are produced by roughly splitting the culm wall by crushing it through a series of narrowly spaced rollers, chopper-rolling (done for pine wood in the scrimber process), and for elements of smaller diameter, brooming. Zephyr describes fine, long fiber bundles isolated from the parenchyma and conductive tissue. These can vary greatly in length and thickness, ranging from fine, flexible tendrils of cellulose fiber bundles isolated from the surrounding ground tissue to slightly wider, stiffer, and longer elements of splintered culm wall tissue, which are generally produced from brooming. Zephyr may be chemically and/or mechanically isolated (Spengler 2013), measuring 1 mm or less in diameter and less than 10 cm in length. They can also be produced using steam to explode the tissue, followed by mechanical separation. These are a relatively new type of element for use in high-performance composites, including webs, needled mats, and pre-impregnation or ‘pre-pregs,’ and because of their high tensile strength and flexibility are of increasing interest in high-performance composites and the automotive industry. Veneer can be a primary processed element from culm stock that consists of a sheet-like lamella of a certain thickness (ZAFU 2014). Veneer can be rotary cut, sliced, or sawn from thick-walled culms or sections of bamboo. Veneer with a thickness of less than 0.6 mm can also be thinly sliced from laminated lumber billets (NFU 2006). This fine veneer is generally used in decoration. It can be attached to a paper reinforcement backing to prevent splitting and used in decorative veneering applications for furniture and cabinetry. Curtain is a larger preform that is made from a collection of thick slivers aligned side-by-side and stitched together. This form of large bamboo curtain is used to make the inner layers of bamboo mat board in a cross-laminated arrangement. Bamboo curtains take other forms such as thin, narrow slivers or larger tiles stitched together into a flat mat (Jayanetti and Follett 2008); the end products are mostly handicrafts including table mats, scrolls, bath mats, and car seat covers. Flattened Bamboo is a whole or half culm flattened through a series of longitudinal cuts or fissures in the culm wall. It is an important building material in the bamboo growing regions of Colombia and other Latin American countries, referred to as Esterilla. It can be used in the manufacture of cross-laminated panels as wall members, floor panels, or cut into beams. Woven Mat is a larger preform that is made from thin interlocking bamboo slivers woven together and is also used for the production of bamboo-based panels. Many of the processes used to convert bamboo into engineered composite products are borrowed directly from wood composite industries. Here, we briefly elaborate on common processing techniques and terminology to facilitate the understanding of element production for engineered bamboo materials. Splitting Open refers to the process of converting culms into splits of typically equal width by longitudinal splitting. These retain both the inner and outer culm walls. Splitting may involve anywhere from two to eight longitudinal splits, depending on the number and width of splits desired. A motorized machine has been developed in China for this otherwise difficult and labor-intensive task that aligns and pushes the pole through the sharpened spokes of a splitting wheel with a nose cone that pushes out the node plates at the same time. An image of this is shown in Table 3. Sawing Open describes cutting culms into splits by longitudinal sawing using either a band saw, or, more commonly, twin circular saws spaced at the desired width of the splits. The edges are clean and straight; however, recovery is substantially lower because of kerf losses and wasted material that arises from the geometric incompatibility between the circular culm and the rectangular splits. Milling Strips refers to the milling of seasoned splits into a consistent rectangular shape using small chipper rollers that mill off the cortex, inner wall, and edges of the splits, converting it to sawdust. Milled strips are commonly 7 to 10 mm thick. Slicing of Slivers refers to the further processing of splits or milled strips into thin slivers using a knife or slivering machine. Traditional production of slivers for use in mat weaving was done by manual slicing of green split bamboo. Today, slivering machines with small banks of pre-set blades and rollers are able to process one dry or green split or strip into several slivers at once. Depending on whether the strip is sliced horizontally or vertically, the resulting widths of slivers end up being either tangential or radial. Also known as: Splitting. Stranding is the process of converting round culms or culm sections into strands for oriented strand board manufacture using blade-mounted disk stranders or ring stranders. Unlike strips, strands are usually less than 10 cm long. Crushing is the term used when split bamboo is crushed into thick fiber bundles. The starter elements for scrimber are bamboo half rounds or splits that have been passed through a series of sequentially spaced rollers (that may be grooved) that progressively crush and split them into rough-surfaced longitudinal fiber bundles. The diameter of these bundles can be controlled by the number of roller steps and the spacing between the rollers, and usually ranges between 3 and 10 mm. Brooming is the mechanical separation of thicker, crushed fiber bundles and chemically separated or steam-exploded tissue into thinner, more flexible zephyrs. It involves tearing the tissue apart using block-mounted needles. Veneering is the production of thin sheets by rotary peeling if the culm wall is sufficiently thick. However, the more common and effective way to produce large sheets of bamboo veneer is to first glue together vertically aligned strips into a thick, wide slab (termed ‘laminated bamboo sheet’) measuring up to 1.22 m wide and up to 2.44 m long that is softened through boiling, then sliced on a horizontal veneer slicing machine (Xiao and Yang 2012). Defibrating of bamboo fibers is performed by passing chips through a defibrator, which steam-softens the tissue and then macerates it between sharp-grooved plates into individual fibers that can be used in fiberboard production. This process was developed for wood chips and is a form of thermo-mechanical pulping (Liu et al. 2012). Element Pre-treatment describes a range of drying, heating, soaking/leaching, autoclaving, and/or chemical treatments of bamboo tissue to preserve it from bio-deterioration, prepare it for subsequent milling/slicing and composite manufacture, or change its color and strength properties. Most culm and element pre-treatments are fairly simple and low-cost. They vary depending on where the processing occurs and into what products. In Colombia, partially seasoned culms of Guadua angustifolia commonly have holes drilled through the wall at or near the nodes, which allows a solution of boron-based preservative agents to penetrate the interior. This treatment removes some of the soluble sugar content from the tissue and preserves it from insects. In China, fresh-cut Moso culms are delivered to the factory and quickly converted into splits, or crushed into fiber bundles for scrimber, which are then air and low-temperature seasoned prior to re-milling and formation into composites. Sometimes, these are thermally treated by autoclaving to preserve and adjust the color tone prior to further processing into milled strips. Thermal Treatment is commonly used for bamboo to both preserve the material by degrading the hemicelluloses and starches in the tissue and darken the tissue for aesthetic purposes. Thermal treatment covers a temperature range of 100 to 170 °C. Unlike direct drying methods, it exposes the bamboo to elevated steam pressure via an autoclave, using approximately 0.2 MPa above atmospheric pressure. Not only does this kill pre-existing bio-deterioration agents, including fungi and insects, it also breaks down and removes some of the sugars and starch in the tissue that make untreated bamboo highly susceptible to such agents. Also known as: Caramelizing. Bleaching is a common form of initial preservation using a boiling bath of hydrogen peroxide (H2O2). The peroxide reduces primarily the amount of phenolic compounds and additionally the sugar content of the culm, making it less susceptible to deterioration. Bamboo products can be subdivided into three main categories: laminated bamboo, reconstituted densified bamboo, and bamboo boards. Laminated Bamboo is a solid section of cold- or hot-pressed milled strips arranged horizontally or vertically. It may be re-milled into smaller pieces such as floor boards or glued in multiple layers to make larger sections of structural lumber similar to wood glulam (Xiao et al. 2008). Also known as: Bamboo Glulam. Bamboo Scrimber refers to solid sections of compressed, adhesive-coated fiber bundles that are heat-cured. These may be re-milled into smaller pieces for cabinet work, floorboards, or decking; however, the material is much too hard and dense for general construction. The tissue in the thick fiber bundles used to manufacture bamboo scrimber is compacted to a significant extent, anywhere up to twice its density if the form is compressed to a final density of 1200 kg/m3 or more. This is standard practice if the scrimber is used for outdoor decking. Also known as: Strand Woven Bamboo; Reconstituted Bamboo; Bamboo Restructured Lumber; Parallel Strand Woven Bamboo; Laminated Bamboo Bundle Lumber; Bamboo Steel. Bamboo Fiberboard is a composite panel comprised of individual bamboo fibers. Bonded hot-pressed fiberboard is manufactured using similar technology and processing to wood-based medium-density fiberboard. Urea formaldehyde or melamine formaldehyde resins are used. Bamboo fiberboards feature in internal sheathing or melamine paper laminated cabinetry. Bamboo Mat Board is a flat cross-laminated hot-pressed plywood-like panel usually comprised of woven bamboo mats in the face layers and stitched bamboo curtains as inner layers. It can contain wood veneer plies and is commonly finished with a phenolic paper overlay. Although it is highly suitable for construction sheathing and flooring underlayment purposes, it is currently used primarily for concrete formwork, shipping container floors, and temporary structures. In India and Vietnam, thinner plywood-like products are made up entirely of woven bamboo sliver mats. Most products contain three to five layers. An innovative variation on the three-ply version developed in India is to impregnate the mats with exterior-grade phenol formaldehyde (PF) resin and hot-press it between corrugated platens to produce a corrugated roofing product for low-cost housing. Also known as: Ply bamboo; Bamboo Curtain Plywood; Bamboo Plywood; Bamboo Curtain Plywood; Bamboo Mat Woven Plywood; Bamboo Mat Plywood; Bamboo Mat Corrugated Plywood. Bamboo Oriented Strand Board is a hot-pressed panel comprised of oriented strands in the surface layers and a randomly oriented core, manufactured using the same technology as wood OSB. Exterior grade PF and/or polymeric diphenyl methane diisocyanate (PMDI) resins are used. With further research and development, this product has enormous potential, particularly in China. Bamboo Particleboard is a hot-pressed panel of hammer-milled particles produced using the same technology as wood particleboard with urea formaldehyde (UF), melamine-urea-formaldehyde (MUF), or PF resins. The most relevant construction application for this is flooring underlayment. In 2002, China produced a six-digit Harmonized System (HS) of nomenclature and product classification that is an internationally recognized system (through the World Customs Organization, WCO) of names and numeric codes to classify Chinese-origin, internationally traded products. The HS is necessary for bamboo product commercialization beyond country borders and includes sub-headings for a number of engineered composite panels and constituent elements, including bamboo plywood, bamboo flooring, bamboo mats and screens, bamboo ‘plaits,’ and bamboo and rattan furniture. COMTRADE statistics produced by the United Nations Statistical Division use this WCO six-digit HS of codes (World Customs Organization 2015). The International Network for Bamboo and Rattan (INBAR) in turn uses COMTRADE figures to compile and monitor the growth in global trade of bamboo products through their online International Bamboo and Rattan Trade Database (Lobovikov et al. 2007). In 2005, the WCO approved a joint FAO/INBAR proposal to revise the HS and introduce a new series of six-digit codes for accurately accounting for different product segments of international trade in bamboo and rattan. 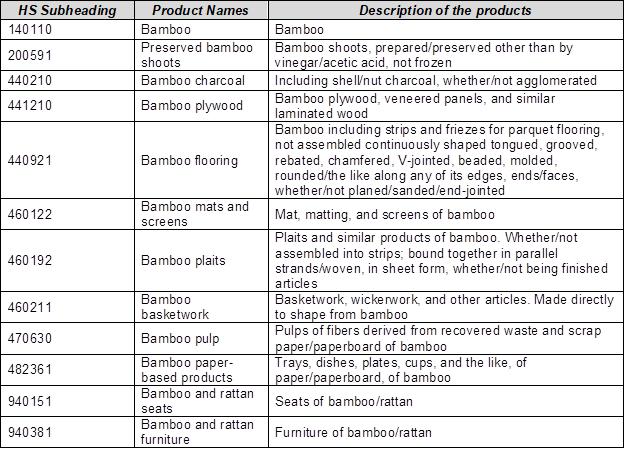 The current codes related to bamboo products are listed in Table 5. Based on our review of the terms and definitions for engineered bamboo products and constituent elements, we propose a revision of the HS relating specifically to engineered bamboo construction materials (Table 6). It should be noted that many of the engineered bamboo product classes, such as laminated bamboo, bamboo particleboard, and bamboo oriented strand board, while commercially manufactured in China, do not yet have building codes developed for them. This hampers their use in construction as direct substitutes for wood-based panels. In these cases, engineered bamboo composites are made from the same element forms as their wood counterparts and are therefore termed bamboo particleboard, oriented strand board, or fiberboard. In other cases, the elements in the bamboo version of the composite, e.g., plywood or glulam, differ significantly in element size and form from standard wood veneer-based plywood or solid clear wood glulam; these are therefore given a more descriptive term derived from the elements to differentiate it from the wood-based equivalent. The reasoning for these changes is discussed below. We believe a few of the existing terms in the HS, such as ‘plywood’ and ‘plaits,’ should be revised to eliminate confusion of the product with its wood-based namesake or substitute a more accurate term. Unlike conventional plywood, which is made from layers of rotary peeled, continuous veneer, bamboo ‘plywood’ (defined here as ‘mat board’) is usually made up of woven sliver mats (and sometimes wood veneers) in the surface layers and cross-aligned internal layers of stitched-together curtains in the core layers. These are commonly overlaid with PF-impregnated paper or polyvinyl chloride (PVC) facings to produce a smooth and durable surface. The internal structure and therefore behavior under load is also different from wood plywood—the core is not continuous; rather, it is characterized by large voids between the long, narrow elements of the curtains. The product is also up to twice as dense as wood plywood, and for these reasons may not be directly interchangeable in certain construction applications. Bamboo mat board is one of the earliest incarnations of engineered bamboo, dating back to the early 1980s. Currently in China, the product is used for concrete formwork and can also be reduced in size to provide the stiff panels used in furniture frames. In India, thin bamboo mat board is produced and pressed into flat or corrugated forms in both structural and non-structural building applications (Pandey et al. 2011). Corrugated mat board is used for roofing applications and made using exterior-grade phenolic resins. This paper highlights some of the ambiguities in terminology and confusion of terms and concepts currently hampering the evolution of engineered bamboo research, industry, and trade. 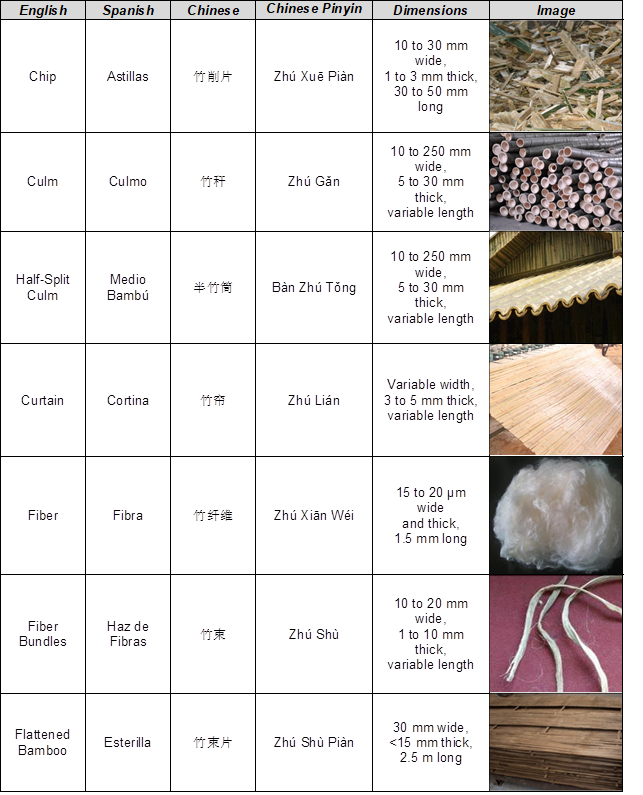 As a step toward standardization in the industry globally, a set of appropriate, recommended terms in English, Spanish, and Chinese has been proposed to describe the breakdown of the raw bamboo materials into processing elements, the range of engineered bamboo products developed, and/or those currently being produced. Five new subheadings for bamboo products that more accurately describe the constituent elements and their manufacturing processes have been proposed for the Harmonized System. It is hoped that the adoption of the proposed standardized system of nomenclature will improve the ease and precision of communications concerning engineered bamboo materials wherever they are discussed and foster the commercialization and use of new products in an international market. This paper is the result of collaboration between research teams at the International Centre for Bamboo and Rattan (ICBR), the University of British Columbia (UBC), and the University of Cambridge, whose contributors are listed alphabetically. The work presented is supported by ICBR Fundamental Research Funds Grant No. 1632013002, NSERC G8PJ Program Grant No. 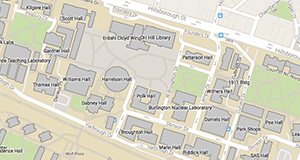 424143-2011, EPSRC grant EP/K023403/1, and the Newton Trust, and forms part of a larger collaboration between UBC, the University of Cambridge, Cambridge Architectural Research, and the Massachusetts Institute of Technology (MIT). We also gratefully acknowledge the contributions of Dr. Wang Ge, Dr. Fei Benhua, and Dr. Yan Yu at ICBR. Anonymous. (2013). “Urban environment design,” News Archit. Ind. 12(078), 262-269. Bowden, J. (2007). “The great ‘scrimber’ mystery,” Inwood Mag. 74, 20-21. CAF (2011). GB/T 265365-2011 Bamboo Strip, Chinese Academy of Forestry, Research Insititute of Wood Industry, Standards Press China, Beijing. Haihui, D., Fangli, S., and Shenxue, J. (2013). “Anti-mold performance of strand woven sympodial bamboo,” J. Zhejiang A&F Univ. 1, 95-99. Hou, X., Jiang, Z., and Ren, H. (2009). “Bamboo and bamboo products standardization in China,” China Wood Ind. 5(8), 22-25. Hu, N., Li, X., Wu, Y., Li, X., Peng, W., and Zhou, X. (2011). “Preliminary study on the production technology of the reconsolidated bamboo and reconsolidated bamboo-wood composite panels for outdoor use,” For. Mach. Woodwork. Equip. 11, 17-18, 21. Hutchings, B. F., and Leicester, R. H. (1988). “Scrimber,” in: Proceedings of the 1988 International Conference on Timber Engineering, Vol. 2, R. Itani (ed), September 19-22, 1988, Seattle, WA, pp. 525-533. ISO 22156-2004 (2004). “Bamboo – Structural design,” International Organization for Standardization, Geneva, Switzerland. ISO 22157-1-2004 (2004). “Bamboo – Determination of physical and mechanical properties Part 1: Requirements,” International Organization for Standardization, Geneva, Switzerland. ISO 22157-2-2004 (2004). “Bamboo – Determination of physical and mechanical properties Part 2: Laboratory manual,” International Organization for Standardization, Geneva, Switzerland. Jiang, Z. (2007). Bamboo and Rattan in the World, Liaoning Science and Technology Publishing House, Beijing, 360 pp. Jin, Q., Yu, W., Yu, Y., Zhang, Y., and Jiu, X. (2012). “Effect of bamboo nodes on crushed bamboo-mat composite properties,” China Wood Ind. 26(6), 1-3. Liese, W. (1998). “The anatomy of bamboo culms”, INBAR Technical Report No. 18. Lin, H., Xu, X., Jin, J., and Liu, H. (2012). Method of Manufacturing Laminated Bamboo Sliver Lumber, US Patent #8231757 B2. Ling, Z. (2011). “Distribution of bamboo culm rot and its control in Boai Country, Henan Province,” World Bamboo & Ratt. 2011(2), 39-41. Lobovikov, M., Paudel, S., Piazza, M., Ren, H., and Wu, J. (2007). Global Bamboo Resources: A Thematic Study Prepared in the Framework of the Global Forest Resources Assessment 2005, FAO United Nations, Rome/Int. Netw. Bamboo & Ratt., Beijing. NFU (2006). 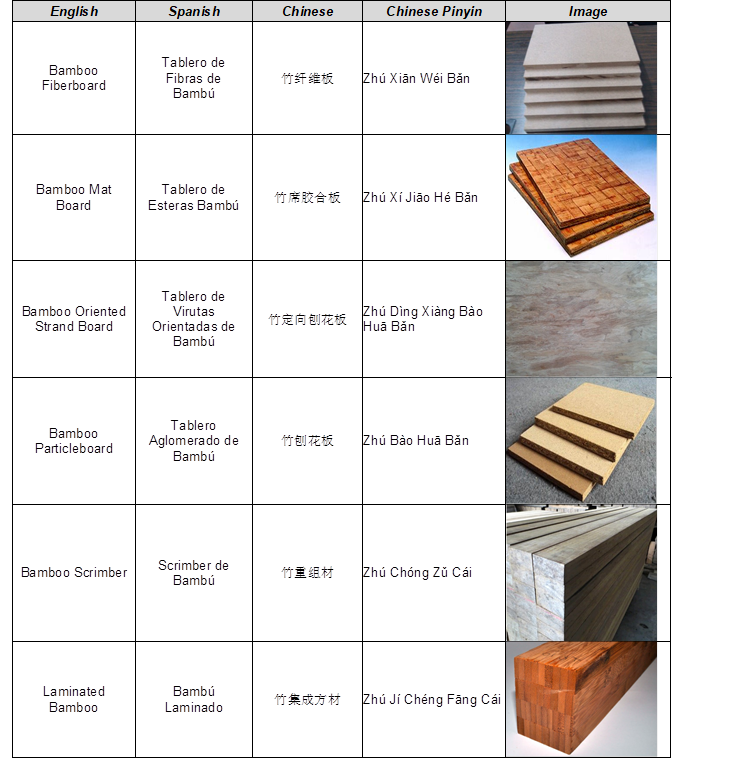 LY/T 1660-2006 Standard Terminology for Bamboo-Based Panels, Nanjing Forestry University, Standards Press China, Beijing. OED (2001). “furnish, n.,” The Concise Oxford Dictionary, 10th Edition, J. Pearsell (ed.) Oxford University Press, Oxford, p. 575. Singh, K., Gupta, I., and Gupta, S. (2013). “Discrimination of bamboo species by shape descriptor of culm sheath,” Indian For. 139(2), 126-130. Spengler, E. (2013). 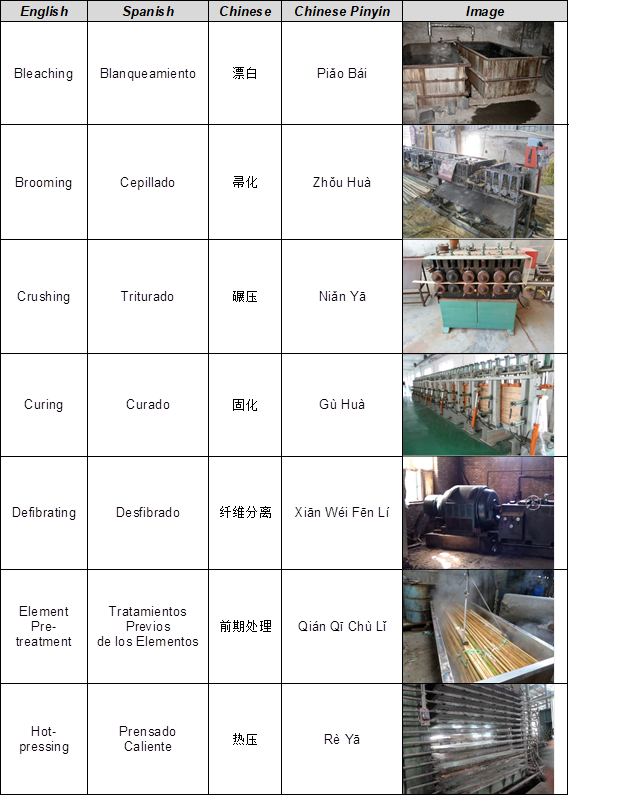 “Organic bamboo fiber manufacturing,” Spengler Technology UG, Germany, http://www.btn-europe.com/organic-bamboo-fiber-manufacturing.php. Tang, T. K. H., Welling, J., and Liese, W. (2013). “Kiln drying for bamboo culm parts of the species Bambusa stenostachya, Dendrocalamus asper and Thyrsostachys siamensis,” J. Indian Acad. Wood Sci. 10(1), 26-31. DOI: 10.1007/s13196-013-0089-4. Vogtländer, J., van der Lugt, P., and Brezet, H. (2010). “The sustainability of bamboo products for local and Western European applications. LCAs and land-use,” J. Clean. Prod. 18(13), 1260-1269. DOI: 10.1016/j.jclepro.2010.04.015. WCO (2015). “What is the Harmonized System (HS)?,” World Customs Organization, http://www.wcoomd.org/en/topics/nomenclature/overview/what-is-the-harmonized-system.aspx. Xu, Q., Chen, J., and Li, X. (2012). “Study on timber beams strengthened with bamboo strips,” J. Sichuan Univ. (Engineering Sci. Ed. ), 44(1), 36-42. Yu, W. (2011). “Development of bamboo-fiber based composites,” China Wood Ind. 25(1), 6-8, 29. ZAF (2009). LY/T 1843-2009 Bamboo Mat, Cushion and Carpet, Zhejiang Academy of Forestry, Standards Press China, Beijing. ZAFU (2014). LY/T 2222-2013 Sliced Bamboo Veneers, Zhejiang Agriculture and Forestry University, Standards Press China, Beijing. Article submitted: March 4, 2015; Peer review completed: July 30, 2015; Revised version received and accepted: October 31, 2015; Published: December 9, 2015.